Zoho Payroll is the new addition in the long list of business and productivity apps of the Zoho Company. It serves India and parts of the United States (Texas and California; more states TBA). In the U.S., the app is built into the Zoho Books accounting system, while in India, it is offered as a standalone app. The online solution is intended to streamline payroll administration as well as automate and make more accurate payroll processing. It lets you centralize and organize employees’ records and information, and gives you lots of options on how to schedule payroll and pay your employees. Zoho Payroll simplifies what is otherwise a complicated and time-consuming process of payroll preparation. It can automatically do payroll calculations, systemize pay schedules, and in a few steps process and approve pay runs. Tax reporting and compliance with laws and regulation are taken care of with tax-ready reports, accurate tax deductions, and automatic preparation of employee income tax returns. It can likewise tax-compliant payslips, calculate required government contributions, and inform you of your tax liabilities as well as year-to-date payroll cost. Aside from effortless payroll administration and processing, Zoho Payroll provides tools for employee onboarding, allowing you to easily add new hires to your payroll and centrally manage all their information. With the software, you can also create a secure employee self-service portal that you can fill with announcements, files, and payroll information that can be accessed and searched by employees. It provides a seamless collaboration platform between payroll personnel and employees where everything is kept in one place. As with all Zoho products, Zoho Payroll deeply integrates with other sibling solutions and, in this case, with Zoho People (HR app) and Zoho Books (accounting app). 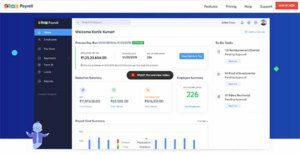 Despite its extensive features, Zoho Payroll is available in one extremely affordable subscription rate that covers one employee per month – a pricing model that lets you scale as you grow your business and add more employees. With the solution, you can run your payroll in just a few clicks and the solution will automatically generate pay-slips online with a complete breakdown of deductions, taxes, and allowances. You can apply custom deductions, pay salaries online (credit directly to employee’s bank) or offline (through checks), and automatically track employee loans. You can create several pay slabs for managers and employees and associate the proper template with each individual. This streamlines pay hierarchies and facilitate faster payroll processing. Non-compliance with statutory requirements is costly and can negatively impact your business. You can steer clear of these situations with Zoho Payroll which handles regulatory compliance by reminding you of tax payment periods and helping you prepare accurate tax reports, returns, and filing. Enable employee self-service with a dedicated portal for employee payroll information. You lessen the burden of your payroll staff from answering employees’ queries regarding salaries, allowances, deductions, and other related matters as information and documents are all there in one place. Employees can even file their reimbursement request right at the online portal. You get complete control through role-based access even as you invite your selected staff to administer or process the payroll. You can grant multiple user roles and allow collaboration among your admin, auditing, and finance teams collaborate effortlessly while ensuring the integrity of your data. Enterprises have diverse wants and requirements and no software application can be ideal in such a situation. It is useless to try to find a perfect off-the-shelf software app that fulfills all your business wants. The wise thing to do would be to modify the solution for your unique needs, staff member skill levels, finances, and other elements. For these reasons, do not hasten and pay for well-publicized leading applications. Though these may be widely used, they may not be the best fit for your unique requirements. Do your homework, check out each short-listed application in detail, read a few Zoho Payroll reviews, call the vendor for explanations, and finally select the application that presents what you require. How Much Does Zoho Payroll Cost? You can contact the vendor for the U.S. edition of the software which, as of this writing, is already available in Texas and California. The payroll app is built into the Zoho Books accounting system. We realize that when you make a decision to buy Payroll Software it’s important not only to see how experts evaluate it in their reviews, but also to find out if the real people and companies that buy it are actually satisfied with the product. That’s why we’ve created our behavior-based Customer Satisfaction Algorithm™ that gathers customer reviews, comments and Zoho Payroll reviews across a wide range of social media sites. The data is then presented in an easy to digest form showing how many people had positive and negative experience with Zoho Payroll. With that information at hand you should be equipped to make an informed buying decision that you won’t regret. What are Zoho Payroll pricing details? What integrations are available for Zoho Payroll?